PlanetMike: Symondshyde access track improved. Improved, originally uploaded by mike1727. I've never been a fan of trail improvements done by non-cyclists. 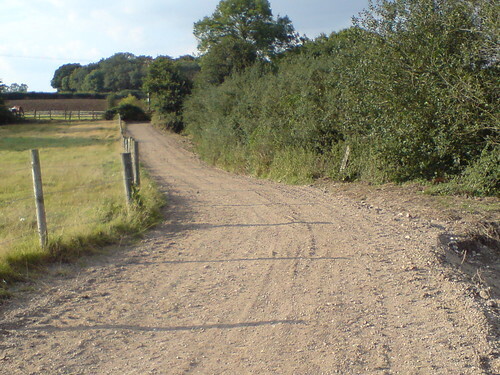 A fat design manual and a love of straight lines and smooth surfaces means these 'improved' trails lose the character they had, changing from interesting to bland, packed dirt to rolled crushed stone. Farm tracks are another matter. They take tractors, for a start, and this means ruts and mud. This section used to be badly rutted and pretty swampy in winter; nothing impassible, but not a section you really want to ride at 8am on a wet January morning in the knowledge you'll have to wash the crud off the bike again that evening. It was a bit challenging to ride in the dark at times too. Now it's looking weather (and tractor) proof, with a crushed stone surface which should stand up to the equestrian traffic too. This is a Flickr badge showing public photos from mike1727. Make your own badge here.